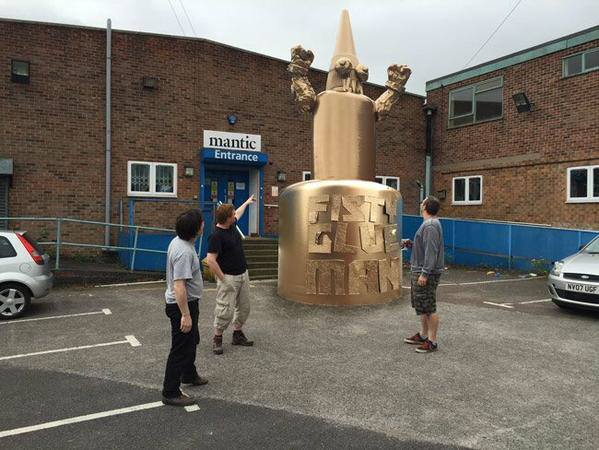 On the weekend Games Workshop unveiled a new statue outside the Lenton Reichstag. This celebrates the release of Age of Sigmar and you have to say it's a nice touch. Not to be outdone Mantic erected their own statue overnight. Nice to see a sense of humour in the industry. I like Mantic's better. Not like I'm bitter against GW or anything. The symbol behind the statue is interesting. Sort of like a Sigmar version of the 40k eagle. 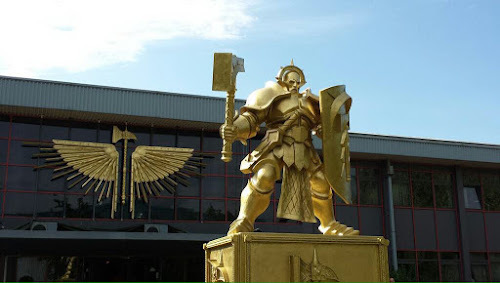 Well Mantic is run by bitter ex GW employees who began with a mandate to rip off their old bosses, so they seem to have played their gag perfectly. wow really professional Mantic. How about you put that time to making your models look better.